These five must-have tips will help you organize your entire basement and get ahead on Spring cleaning with easy storage solutions for all of your belongings. When Ashley and I were packing up our duplex prior to moving into our house, the most stressful room for me was our basement. For years the basement was the place I put things when I had no idea where else to put them. This led to narrow pathways and a feeling of being completely overwhelmed every time I went into the basement. I kicked myself, wishing that I had organized the basement sooner. Now that we moved into our house and have less belongings, I’m able to create storage solutions for our basement before it gets that bad again. And you can use these tips to organize your basement as well. Even if you don’t have a basement, most of these tips still work great for your garage or attic. Start to organize your basement by separating your items into 3 piles: Keep, Throw Away, & Donate. I was amazed at how much garbage and recycling had amassed in the basement. I was able to get rid of quite a few things that were broken or just needing to be recycled. Getting rid of the obvious trash is the easiest way to quickly clear space. The other two piles are more difficult. I am a pack rat. I have a serious addiction to thinking I’m going to use something again in the future. You need to be honest with yourself and decide if something is really needed and worth keeping. If you can truly justify a need and use for something, then keep it. Otherwise, donate it to your local Goodwill or other charity. You’ll be saving space in landfills and helping out some worthy causes. Shelving is one of the best ways to organize your basement. You can maximize the space in your basement by building up to the ceiling. Shelving can be preassembled pieces from your local hardware store or built at home by a do-it-yourselfer. Simple shelving can be put along the walls. You can build in shelving under the stairs. One great trick for storage in an underutilized space is to attach wire shelving to your ceiling. You can store shoe box bins on the shelving between the floor joists. Storage bins are another way to maximize your space when you are trying to organize your basement. They allow you to stack items that don’t easily stack. You can stack storage bins on your shelves or just on each other right on the floor. Storage bins come in numerous shapes, sizes, colors, and materials. You can try clear bins to see what is inside of them. You can also use colored bins by type such as crafts or sporting goods bins. We just got these awesome bins from Amazon. They are super strong and stack 5 high. Remember when you were awesome and organized everything in your bins and then stacked them on top of each other? Everything was both out of the way on your shelving or stacked to the ceiling. The problem with that is that more than likely you’re going to bury or forget about things. This is especially problematic for food. By the time you unbury it, your food may be expired. Then you shouldn’t eat it, and also can’t donate it. One solution is to use clear bins to organize your basement. That way you can see everything inside your bins. Another way is to label all of your bins. I bought Ashley this Dymo Labeler last year and she basically labeled everything in sight. You could also tape a piece of paper to the front of your bin detailing the contents. One thing that might be counter intuitive is not nesting your luggage. Most luggage sets are designed to nest 2 smaller pieces in the large piece. If you don’t use luggage very often, you may forget about and not use the smaller pieces. One trick is to put the largest piece against the wall and the the smaller pieces in front. You won’t use that much extra space and you’ll see all the pieces. If you find yourself not using all the pieces, than you may want to consider donating some of the unused pieces. Let’s face it. Life doesn’t always go according to plan. Basements flood. Pipes break. Things get dusty. You will not be a happy camper if one of those things happens to you. So when you are working to organize your basement, you need to protect your investment. Pallets are an inexpensive way to keep things off the floor. If your basement floods, you’ll have a couple inches of space off the floor to protect items from water damage. Don’t put electronics or anything else that is sensitive to water under your water pipes. If you have a burst pipe, those items won’t be destroyed. From time to time, mice or bugs may get into your basement. Make sure all of your bins are securely shut. This will help protect them from unwanted critters. You can also cover your items with plastic sheeting to protect them from dust and moisture. Lastly keep all of your items a safe distance from refrigerators, freezers, furnaces, and water heaters. These items all need ventilation and keeping things too close to them is a fire hazard. I’d love to know: What are your favorite tips on how to best organize your basement? These are great organizing tips! 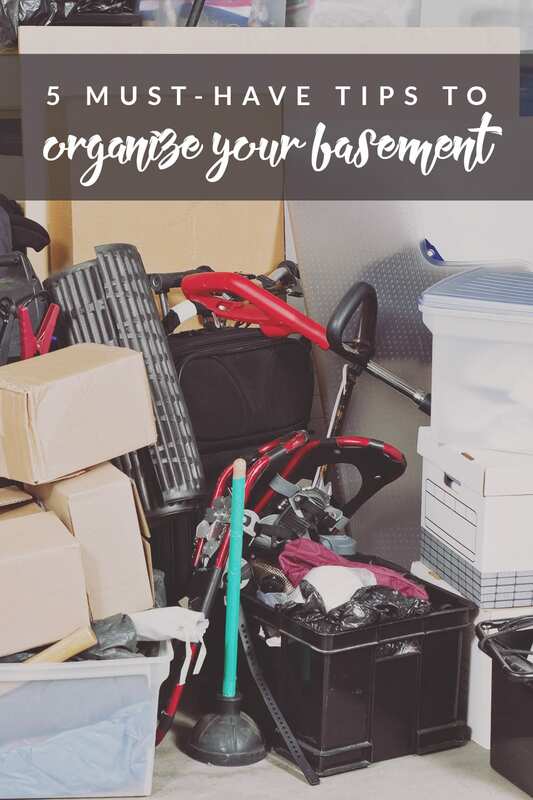 We don’t have a basement – actually, you don’t see many basements here in the south where I live, but I’m always on the lookout for new ways to organize. Glad to see my basement isn’t the only one that looks like a bomb blew up in it! My oldest moved out so we have been busy adjusting her room and making it into our office. Along the way we have realized that we are drowning in stuff…time to clean out the clutter! We don’t have a basement but our garage and crawl space could use some organizing. Thanks for these tips. I want to get the spaces in order before Spring. This is great advice. I could probably use these tips for the furniture in my storage garage too. Great tips! I need to do all of these to get my basement organized. It is a disaster. Those are some great organizing tips. I have so much stuff that it is the perfect time to start organizing it. Love using clear bins or at least ones that are easily marked. It is such a pain going thru container after container because you don’t know what’s in them! Great tips! My basement has become like a jungle throughout the years of not organizing. I’ll keep these in mind. I guess I am lucky in that I don’t have basement to clutter up!! I’m sure if I did I would totally need these tips!! LOL!! This is such an awesome tips, we don’t had a basement in our house but I could use this in our guest room that looks a like a basement lol. I love everything about this post. I have a terrible habit of “out of sight, out of mind” items that need to be dealt with. Oh wow, this is such great advice. We don’t have a basement anymore, but when we did, boy oh boy it was hard to manage. I’m organizationally challenged so these tips are right up my alley. I definitely think shelving is a must fr an organized basement. We finally bought a few shelving units and a bunch of plastic bins and everything is so much more organized! we don’t have a basement but i love how these tips can be used pretty much everywhere! i’m big into separating into piles. My husband and I are doing a massive declutter in the basement…it’s going to take a while since my husband tends to want to hold onto things a lot more than declutter and it’s predominantly his domain. We’re learning how to work together though so that’s a positive. We’re blogging about the process if you’re interested in dropping by! Visiting from Pintastic. What great organizing tips, especially to protect your items. Often folks are so tired after decluttering and organizing that they don’t think about protecting all their hard work and items. Thanks for sharing at the #ThisIsHowWeRoll Link Party on Organized 31. GReat ideas! We use clear bins and label top, front and one side at least and try to keep them in a single layer! Thanks for bringing this by Throwback Thursday!